2017-2018 Finish: Reached Div. 3 South preliminary round. After a two year drought of postseason hockey, the Bombardiers made it to the playoffs last year and are aiming to make it two years in a row. The Bombardiers only had three seniors on the roster last season, so the majority of the squad is back, plus a familiar face is back in the fold this season. One of the three seniors that graduated was Jake Parker, who led the Bombardiers in scoring last season with 26 goals and eight assists. But Attleboro is slated to return its next three scorers in senior Cam Littig (12 goals, 14 assists for 26 points), junior Ryan Morry (11 goals, 15 assists for 26 points) and senior Kyle McCabe (three goals, 10 assists for 13 points). Another positive is that the Bombardiers have some experience in goal. Both senior Evan Andrews (13.66 games played) and junior Derrik Rivet (6.33 games) are set to return. Having an experienced goalie is a huge positive but having a strong backup helps even more. Andrews had 270 saves last season with a 0.882 save percentage while Rivet turned away 144 shots and had a 0.842 save percentage. In front of goal, McCabe, Sam Flynn, and Matt Viveiros will be joined by Liam McDonough, Kyle Miniati, and Zach Pierce as members of the defensive unit. While Littig and Morry will try to replicate their success from a season ago, one name that could help bolster the offense is senior Sam Larkin. Larkin played his freshman year and had seven goals and seven assists before switching over to juniors. His experience should give Attleboro a boost during the season. 2017-2018 Finish: Reached Div. 2 South semifinal. Canton comes into every year with high expectations and the Bulldogs will be favorites to bring home a ninth straight Davenport division title and 11th Hockomock League title in the past 12 seasons. While the league campaign is a priority, the Bulldogs will also be comparing themselves to the top teams in Div. 2 and hoping this will be the year to break through in the South sectional and get back to the TD Garden for the first time since 2010. After a dominant winter, the top scoring line is back in full for Canton. Senior Ryan Nolte, the reigning HockomockSports.com Player of the Year, and junior Johnny Hagan, the reigning HockomockSports.com Underclassman of the Year, will draw most of the plaudits but junior Timmy Kelleher gives the Bulldogs strong play on the other wing as well. That line combined for 69 points last season (27 apiece for Hagan and Nolte) and will be one of the league’s best going into this year. Canton also has juniors Tommy Ghostlaw and Chris Lavoie back to add scoring punch to the second line. At the blue line, juniors Owen Lehane and Jack Connolly will both be expected to eat up a lot of minutes after strong sophomore seasons, and the Bulldogs will be looking for other players to step up and fill in defensively. After consistently strong goaltending from Quinn Gibbs over the past few seasons, Canton will turn to senior Mike Staffiere, who has been a backup the past two years and is drawing great reviews for his play during the preseason. Foxboro is coming off the best season in program history, as the Warriors won 10 games and qualified for the state tournament without relying on the Sullivan Rule. Now, the Warriors come back this season hoping to build on that season and make another run at the state tournament behind an offense that, according to coach Mark Cedorchuk, is as deep as it has ever been. Junior Ronnie MacLellan and sophomore Kirk Leach are two of the forwards to keep an eye on this season for the Warriors after the duo combined for 15 goals and 32 points last season. Also up front will be senior Tanner Kennedy and juniors Sebastian Ricketts and Josh Bertumen, who combined for 10 goals last year and are looking to continue their development to add depth to the attack. Senior Brendan Tully will lead the defensive effort but is also the team’s leading scorer. The blue line standout scored 18 goals and had 19 assists and is going to be a major factor in all three zones as well as a leader on the penalty kill and power play. He will be joined on the blue line by junior Kyle McGinnis, while junior Espen Reager will be between the pipes this year. 2017-2018 Finish: Reached Div. 1 South first round. Franklin started well last winter, reaching the final of the prestigious Mount St. Charles tournament and taking a point off Malden Catholic for the first time, but the Panthers couldn’t carry the momentum throughout the season and were knocked out in the first round of the tournament. As usual, Franklin graduated a lot of players, but also return a strong corps of experienced players to take on arguably the program’s toughest regular season schedule, which is loaded with some of the state’s top teams. The Panthers return 11 seniors for this season, including eight forwards, but also have a group of eight sophomores that are jumping up from the JV to contribute on varsity this season. The forward line has plenty of experience and should be able to fire in the goals this year. Seniors Joey Lizotte, Zac Falvey, Scott Elliott, Dan Magazu, and C.J. Spillane will all be able to jump into the top scoring lines after playing major roles last year. Defensively, the top five defensemen will be juniors Tom Tasker (who was on the HockomockSports.com All-Underclassman Team last year) and Colin Hedvig and seniors Cam Casella, Matt D’Errico, and Evan Forbes. Three sophomores will also see time on the blue line for the Panthers this season. After graduating three senior goaltenders, the job is open to senior Ryan Cameron and junior Ray Ivers, who are both making the jump from JV. King Philip brings 11 players back from last year’s squad and is hoping a tough schedule will result in a battle-tested team ready for the D1 South Tournament at the end of February. It starts with the seniors for the Warriors with four of them back, plus a transfer. There will be a lot of experience in the top line for KP, as well as its first defensive pair and between the pipes. Captain Ryan Fitzpatrick (10 points) had a strong season last year and will be trying to replicate that this year. Fitzpatrick is joined by assistant captain Luke D’Amico (13 points) as wingers while senior transfer Brendan Shandley steps in at center to give the Warriors a formidable line to work with. Juniors Chris Daniels (13 points), Joe Boselli (11 points), and Jack Coulter (10 points) are all back after successful sophomore seasons and should provide KP with good depth. On the blueline, veteran Garrett Maxwell is the lone senior back from last year so he will be relied on for leadership. He is one of the strongest players in the league and plays in all situations for KP, including the power play plus the penalty kill. There will be some other familiar faces on defense for KP with junior Kyle Gray (seven points) and sophomore Rocco Bianculli (eight points) both back with varsity experience. Senior James Lewis takes over in the crease as the starting netminder for the Warriors. Lewis saw action in three games last season, including a pair of wins and shutouts. While new to the starting position, Lewis has plenty of experience and that bodes well for the Warriors. Jesper Makudera and Nate Ihley will be pushing for minutes in net as well. The Hornets have a strong core of players back this season, along with the addition of a couple of new faces, and head coach Mike Balzarini is hoping that combination will result in success this season. Experience will be a strong suit for Mansfield as five of its top six forwards played significant minutes last year. Chris Copponi (12 points) and Matt Copponi (16 points) will be on the wings around center Coleman O’Brien for one line while Jake Lund (eight points) and Kevin Bellanger are returners on another line. The sixth forward will be center Jack Garland, who played juniors last year but is back in the fold for the Hornets this year. Ben Ierardo, Cam Page, and Braedon Copparini will be in the mix for minutes as well. Defensively, while there are certainly some holes to fill, Balzarini has some talent to rely on the blue line. Two-time HockomockSports.com selections Mike Arnold and Tyler Oakley graduated so there is a little bit of a void, but Austin Ricker has stepped on early on to anchor the Hornet defensive unit. Ricker is joined by Brad Grant, who played for the Hornets previously before switching to juniors. Nick Levine and Joe Troiano gained valuable experience last year, and Jack Gormley and Brian Grant should be in the mix as well. Mansfield also has experience in the goalie position with junior Sean McCafferty back between the pipes after having a breakout sophomore campaign. McCafferty was one of the top goalies in the league last year, earning HockomockSports.com All-Underclassman honors. He had 377 saves and a 92 save percentage, which bodes well for the Hornets this year. Defense will be key for the Rocketeers during the 2018-2019 season. With a handful of returners back on the blue line as well as veteran goalie Ryan Warren, North Attleboro boasts a talented defensive unit. Senior captain Brendan McHugh will anchor the defensive group alongside juniors Jeff Baker and Will Yeomans. All three are very experienced players that put defense first. They can all get involved in the offense as well. Warren has shined between the pipes each of the last three seasons, earning HockomockSports.com Underclassman of the Year as a freshman and was a HockomockSports Third Team selection last season. Warren is pushed in practice each day as Chris Ulrich and Nick Digiacomo push for time. Offensively, North Attleboro only lost two forwards from last year’s group, but those two players (Drew Wissler, Jason McNeany) combined for nearly half of the Rocketeers’ 76 goals a season ago. So this year, Big Red will need forwards to step up and contribute. Captain Anthony Zammiello scored 13 goals last year and will look to continue his success this season. Todd Robinson, Justin Moccia, Dennis Morehouse, Jake Ebert, and Jack Connolly are all candidates to have big years for the Rocketeers. 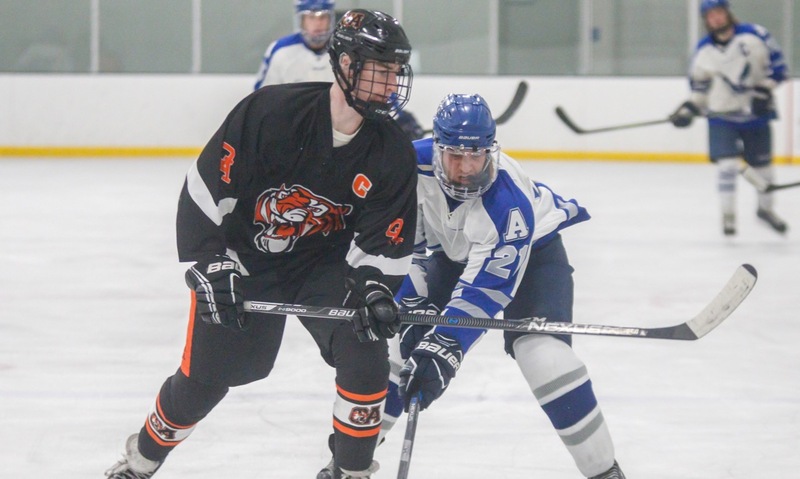 Speed has been the strength of the Tigers since Sean Bertoni took over the team and Oliver Ames will be relying on that speed and aggressiveness to try and challenge Franklin at the top of the Kelley-Rex division and to make a run in the state tournament. With a few players coming back from juniors to join with an experienced group, OA has high hopes of pushing the Panthers for the league title. Senior forward Brett Williams will be the key player in the attack, coming off a season in which he scored 21 goals and recorded 15 assists and was named to the HockomockSports.com First Team. Williams will have plenty of help up front from senior Colin Bourne, who is one of the fastest skaters in the league and had 13 points last season. Senior forward Cullen Gallagher will also give the offense a boost, as he comes back to the program after a year in juniors. Senior Matt McCormack was one of the league’s top defensemen last year and his steadying presence on the blue line will be critical to OA improving on that end of the ice, after giving up 54 goals as a team last year. Senior James Beatty is back after a year in juniors and should be a big boost to the blue line. Junior Owen Connor is back in net and looking to build off last season’s efforts. Overall, the Stoughton Black Knights will be on the young side but they have a veteran first line that will lead the way. The Knights will be looking to improve on last year’s record, while possibly trying to surprise some teams along the way. Leading the way offensively will be senior Sean Doherty. Doherty was Stoughton’s second-leading scorer last year behind Brendan Campbell (graduated). Doherty was second on the Black Knights with 12 goals and added 11 assists and will be relied upon to be a key piece of the offense this season. Joining Doherty on the first line will be senior Luke Bainton, who brings a lot of varsity experience to the table. Bainton will look to improve on last year after recording seven points (four goals, three assists). Senior Josh Hough will anchor the blue line for the Black Knights. In his fourth year on varsity, Hough has logged a lot of minutes on the ice over the past couple of seasons and will be one of the most experienced defensemen in the league. Hough is able to create on the offensive end as well, scoring a pair of goals last year along with seven assists. Senior Thomas McCoy is set to return in goal after getting experience between the pipes a season ago. Taunton has been a program on the rise for the past few seasons and last year the Tigers took another big step forward by making a push to the Div. 2 South semifinal. That unexpected tournament run as the No. 13 seed, which included wins over No. 4 Old Rochester and No. 5 Nauset, has boosted the team’s confidence heading into a new year in which all but four players are back. Scoring has not been a problem for the Tigers in recent seasons. Last year, Taunton scored a league-best 98 goals, five more than Davenport champ Canton, and senior forward Cam Sneyd (30 points) and junior Mike Albert (32 points) both eclipsed the 30-point mark. Senior Jack Patneaude added 15 points last year and he is poised for a big year along with classmates Jaden Weyant, Owen Ross, and Nick Vandermeel. The defense is almost completely returned from last year, led by senior Andrew Carter, who was solid in the defensive zone but also chipped in with 20 points. Senior Brady Nichols and sophomore Dylan Nichols are also back for the Tigers. Junior Sean Bunker returns in net after a solid performance in the tournament run and he will be backed up by classmate Andrew Gomes, who has shown that he is a capable replacement when needed.